Joining Bart this month are Guy from the My Mac Podcast, Robert Carter the Tech Doctor, Ewen Rankin form the British Tech Network, and Nick Riley. 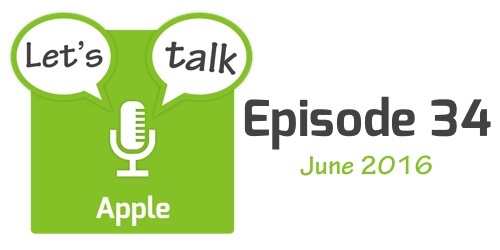 The show starts with a few followups to some stories from May, before having a quick look at two Apple-related legal stories which broke in June. The five main stories are changes to the App store announced before WWDC, WWDC itself, the probable removal of the headphone jack from the next iPhone, Apple’s withdrawal from the Republican National Convention in protest at Donald Trump, and Senator Warren’s criticism of Apple and other tech companies for practices that make it hard for competition to thrive. The show finishes with a quick rundown of some other shorter stories that made the news in June.